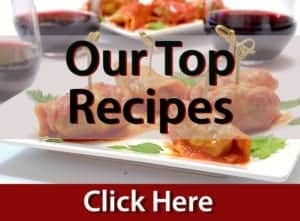 We’re so excited to share this recipe with you, written and prepared by our number one resource for all things food and our favorite cook in the whole world. She’s an artist, a chef and our very own sister, Culinary Institute of America graduate, Chef Kathy Zehr. When a rotisserie chicken enters my home, the first welcome it gets is to have the meat separated from its carcass. Sometimes. Depending on the day, I may eat those tasty little wings and then separate the meat from the bones. A day or so ago, I looked in my fridge after sharing a meal of baked chicken with a friend. Over half was left. I also saw that there was a hearty portion of mashed potatoes and some raw sliced mushrooms, all needing to be used. 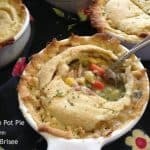 That’s when I recalled the petite pois in the freezer and I knew then and there that I needed to make some chicken potpie. I place the bones in a pot, along with a bay leaf, a small chopped onion, a couple of stalks of chopped celery and some parsley thyme. After filling the pot with cool water to cover the carcass by an inch or two, I heat to medium high to boil and turn down to a slow simmer. This cooks for at least three hours and as long as five. Keep the bones covered with water by adding occasionally as it evaporates. The chicken meat gets returned to its container to set in any remains juices in the fridge. After I pour the hot stock through a colander, I let it cool for a half hour or so and then refrigerate it if I’m not going to use it right away. The holidays having come and gone, I still had extra butter from the annual cookie bake off that needed to be used. This is why I decide to use a pate brisee recipe for the crust of my pot pie. Along the way I decided to add some carrots and a few other odds and ends. You will find my recipe below. Once you get the stock rolling you have some options. If you want, you can go ahead and prepare the dough and the filling and place in the fridge for use later in the week. Or, because it needs to be refrigerated an hour or so before being rolled, you can make the dough next. Finally, you can skip the crust making all together and pick one up at your favorite grocery store. The most important thing to remember is that this should be something not only delicious but fun as well. Thus, have a good time with this one. Relax and enjoy! 1 small onion medium dice. Place all ingredients in stock pot with enough room to add 1 to 2" of cool water above ingredients. Bring to a boil, then adjust temp to a slow simmer. Cook 3-5 hrs., occasionally adding enough liquid to keep bones covered. Strain stock. You should end up with 4 to 6 cups. If you want to reduce stock further (if you have at least 6 cups or you want a little more flavor) just slow simmer while your working on other steps. Saute onion and celery in butter, until onions are transparent.Don't brown. Add sliced mushrooms and continue to cook until mushrooms loose their moisture. Add sherry, bring to simmer for about a minute, then remove pan from heat. Make slurry out of water and flour. In a pot large enough to accommodate all filling ingredients, heat stock while whisking in slurry. Bring to a simmer until stock starts to thicken. Add bay leaf and allow to cook for about ½ hour. Add chopped carrots & pulled chicken meat, dried herbs. Allow to cook until carrots are just tender. Add peas, corn & mashed potatoes. Taste & adjust seasoning with salt & white pepper to your liking. Cut chilled butter into small pieces and add to flour & salt. With fork or pastry blender, work ingredients together until mixture looks like course meal. I usually use my hands at the end. Add enough water so that the mixture just sticks together. Make a disk and wrap in film and refrigerate at least 1 hr or up to 3 days. Once dough has rested, remove from fridge, remove wrap and let set on rolling surface for 20 minutes. While your dough is waiting, preheat oven to 425* and choose your potpie dish. I think a depth of 3" is about perfect. Place filling in dish. Leave about 1/2" clearance on top. Lightly flour rolling pin & rolling surface. slowly and gently begin to roll disk. Have a little patience here. When I first starting making this, I would work my pin too fast and too hard. This led to split sides and a mass of dough that was impossible to remove from surface in one piece. Flip back and forth, gently sprinkling with flour prevent the dough from sticking to the surface. Once the dough is approximately 1/8" thick, it's time to place atop the chicken mixture. Roll your dough over pin and gently cover the surface of your soon to be pot pie. If you have trouble with this move, use a cereal box side that you've cut apart, and wiggle under dough as you would a peel for pizza. Pinch dough around sides, venting crust out. Cut vents in crust. I like an S shape with a few small slits. Place in oven for 25 to 30 minutes. 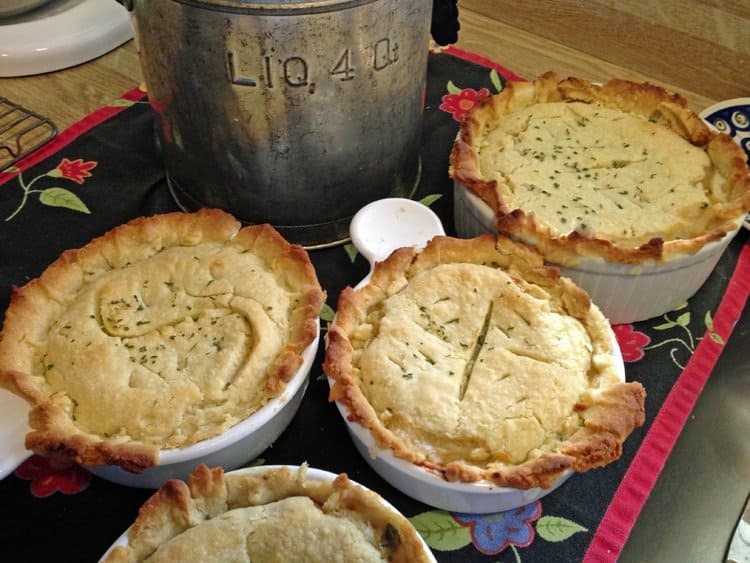 Pot pies are always a favorite around here. So cozy, comforting, and hearty. The perfect meal for when the weather turns cooler. Oh, this would be so good! Love the pate brisee! Nicely done! I love mini pot pies! Such a great individual dinner. I also use white wine in my cooking a lot and it’s so good! Chicken Pot Pie has to be the ultimate comfort food. I love that you used a Pate Brisee – that’s one of my favourite pastries. What a delicious way to love your leftovers! Thanks so much, Karyn. 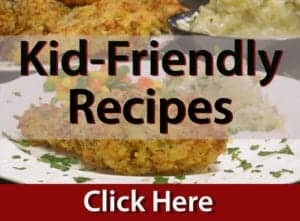 I think your whole family will enjoy this recipe! 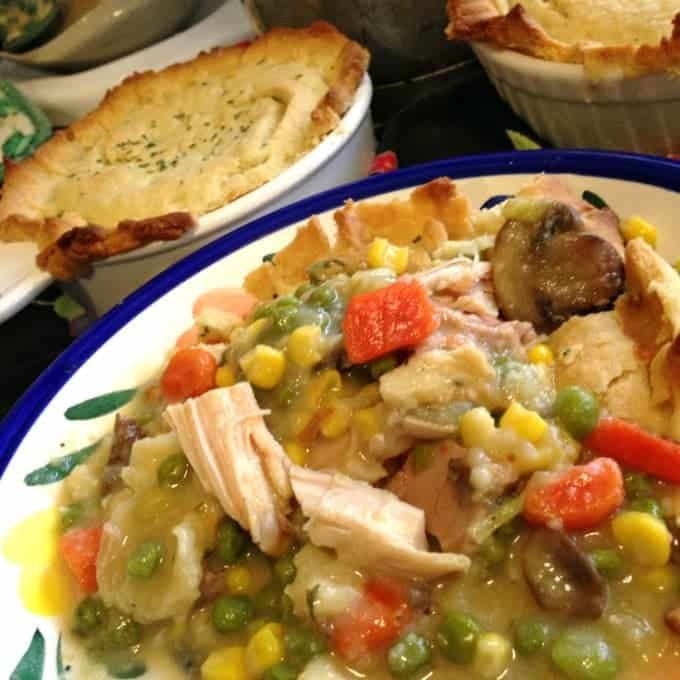 This Chicken Pot Pie looks absolutely scrumptious! I am saving the recipe for later! Thanks, Tania. I know you will love! Oh my goodness! This looks heavenly. The crust, the filling, everything looks and sounds amazing. I guess I’ll have to make it soon, or I’ll be dreaming of it until I do! oh man.. this sounds fantastic. confession time- I’ve only ever eaten the chicken pot pies you buy in the freezer section. this sounds amazing! Sarah, it’s time! Thanks for stopping by Platter Talk. Everything about this sounds delicious and wonderful! But what’s best, it looks simple enough to make!! Can’t wait to try it! This recipe is fantastic and simple! It’s such a comfort food. 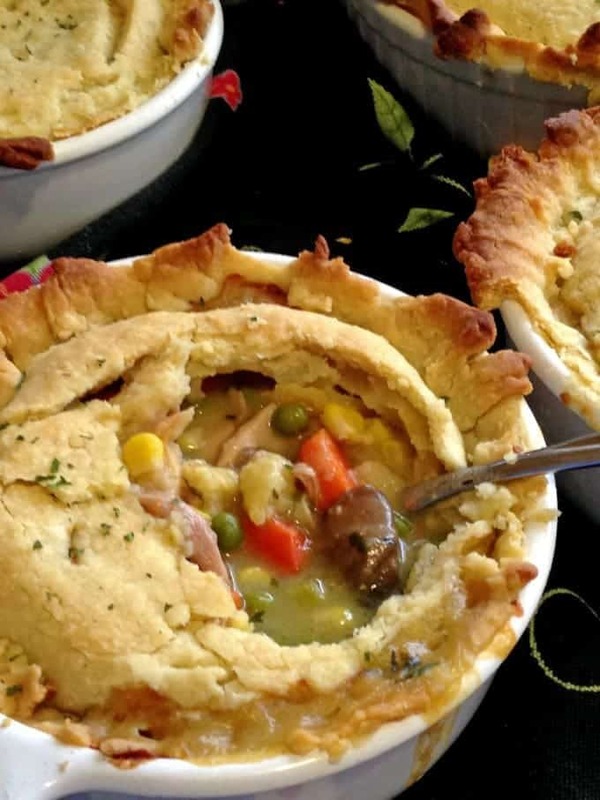 I seriously love a good pot pie and yours really looks like pure comfort food to me. Thanks for sharing such a hearty meal idea. I bet my boys would gobble this down in no time. Exactly the type of comfort food I am looking for on these cold and wet German winter days. Thanx for sharing! We are happy to give you some inspiration; thanks so much for stopping by and also for your lovely comments. Stay warm! These chicken pot pies are just stunning! I love the homemade stock and the beautiful vege-packed filling. What a great recipe!! Thanks for the comments, Nicole. I’m naturally curious, is pot pie common in New Zealand? It looks so delicious Dan, the all butter crust, oh my gosh! This is comfort food ! Agreed Mary, comfort and yum, all the way on this one! Oh goodness, your pot pie is absolutely stunning and no doubt incredibly delicious! There’s is nothing like a homemade pot pie. Looks so delicious! Thanks for the comments, and yes – so dielish! Absolutely stunning photos! I could just dig right in! And the recipe is simply fabulous! Love that it’s all from scratch – that always tastes the best! Thank you for a delicious recipe! Thanks for the great comments, Gretchen. Chef Kathy certainly makes it look easy and mouthwatering! 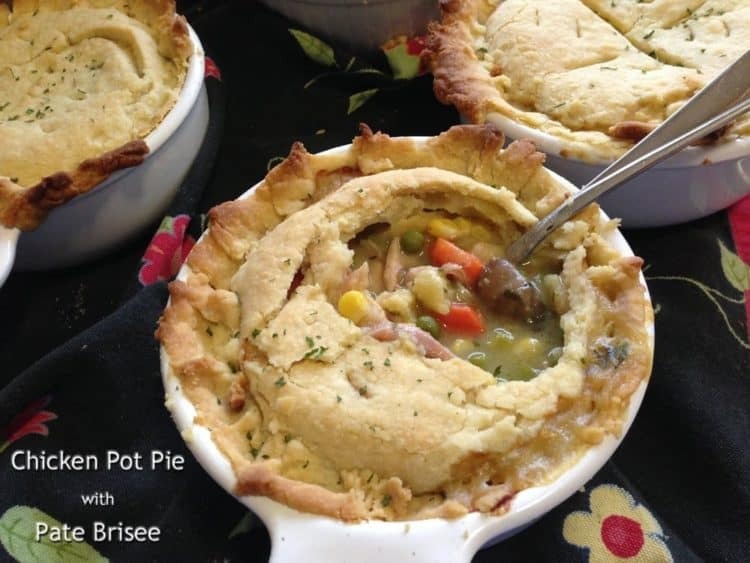 Beautiful pot pie and the recipe sounds delicious. Susie, Thanks for stopping by and yes, I could use some of this myself, right about now! 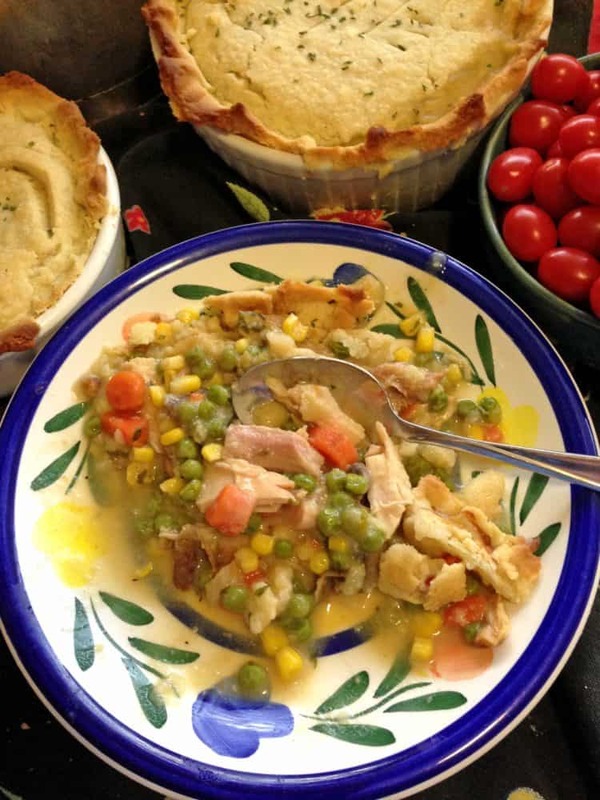 Chicken Pot Pie is the consummate comfort food in my book and your rendition looks amazing my friend! I could not agree more, Patty. Thanks so much for your comments!